Andrew Sylvia and I had conquered every challenge the deserts of the south west had thrown at us. Even with our photos of the trip, it's hard to know how many times we had truly broken down, or how many hours we had spent on the side of the road. Nic and Steph Foster had helped us get back on our feet, and our final leg to reaching a west-coast city was mostly trouble free. When we arrived in San Diego, our friend and fellow photographer, Casey Withers, had rounded up some SoCal friends for an evening of food and photos. After stuffing our stomachs with burgers, we found the closest suited parking garage, set up the strobes we had hauled on the trailer behind us, and had fun shooting cars and talking shop. Late that evening, we called it a night, crashing at Casey's place, where we departed from the next morning. 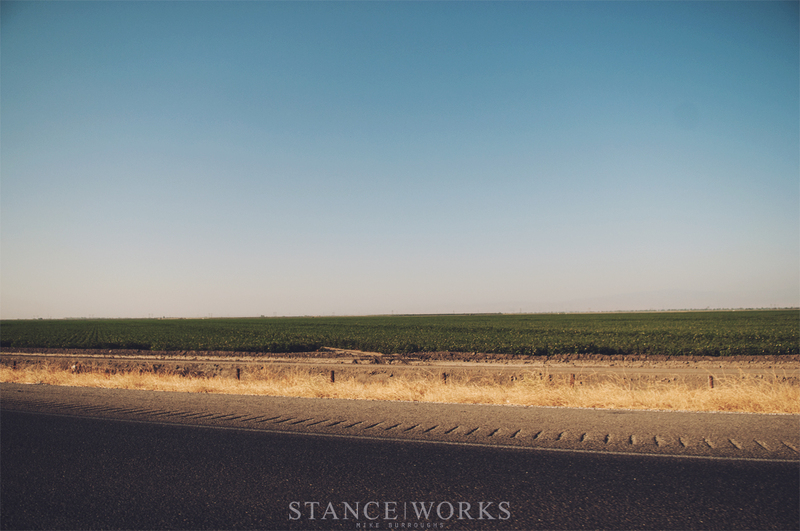 We were headed to the Bay area, where our long-time friends and StanceWorks family were anxiously awaiting our arrival. We hopped on "The 5," and set forth, ready for a week-long stay. 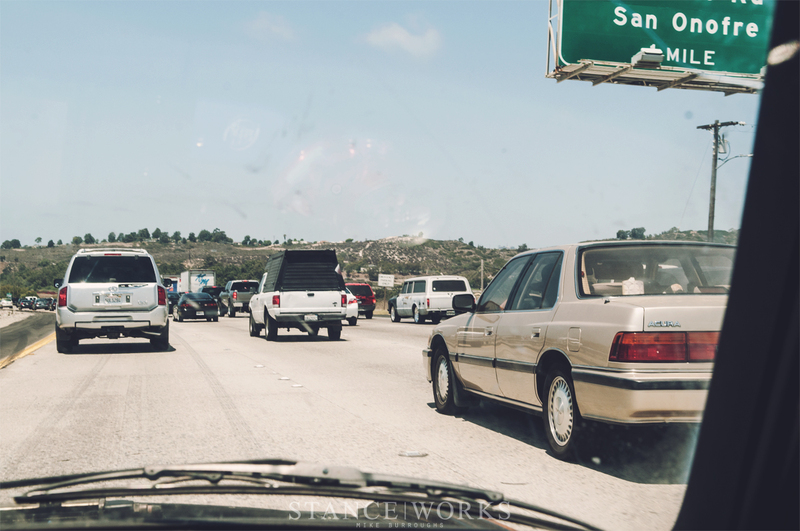 Of course, with that came our first true Californian experience: LA traffic. We sat bumper-to-bumper, hoping Rusty's fixes would hold and keep us from overheating, which was fortunately the case; however, our progress was slow - and we were fools to expect otherwise. Although, once we cleared LA and the mess of roads that expand from it, the beauty of central California began to surface. Our journey took up much of the day - our late departure from San Diego and LA traffic made for a full day of driving, but it was welcomed. At the end of the evening, we could say "we did it." We'd have reached the half-way point; even if Rusty blew himself to pieces, we'd have made all the progress we truly wanted, meaning the last few miles on the trip to San Jose were some of the best of the trip. As the sun set, the colors of the sky spilled over on to the vast hillsides of California, and the temps were cool for once in our journey. If any part of the trip could have been called perfect, that was it. That is, short of losing both brake lights on the trailer and needing to source some magnetic battery-powered flashers from a truck stop on the way up. 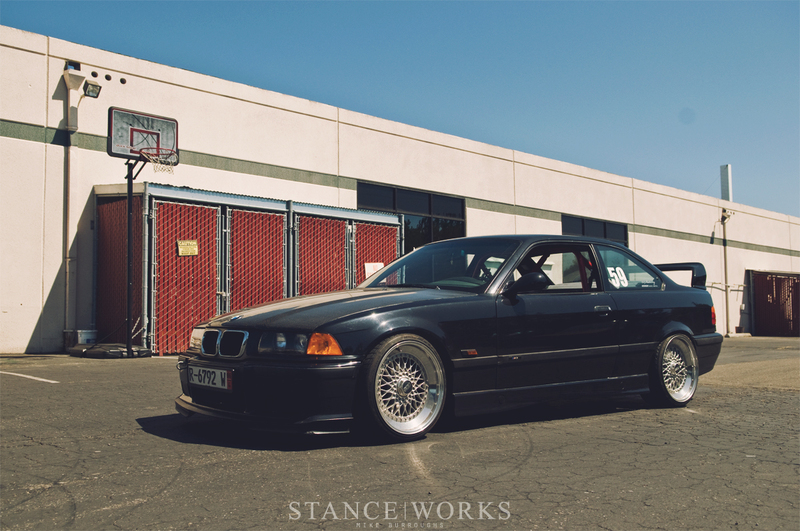 Seeing Sean's E36 for the first time was what set things in stone for Andrew and me. We had arrived, and Sean Williams, one of the founding StanceWorks members, was there to greet us and celebrate the success. We dropped off the trailer - and just in time - as the rear mounts were beginning to fail. Had we travelled a few hundred miles more, it could have been catastrophic. We dropped our belongings off at Sean's place, and off we went. We set off towards Brad Harris' house, where the rest of the StanceWorks troops would be gathering for a day of horsing around and turning wrenches. When we arrived, Sean and I parked our cars and couldn't help but look back. 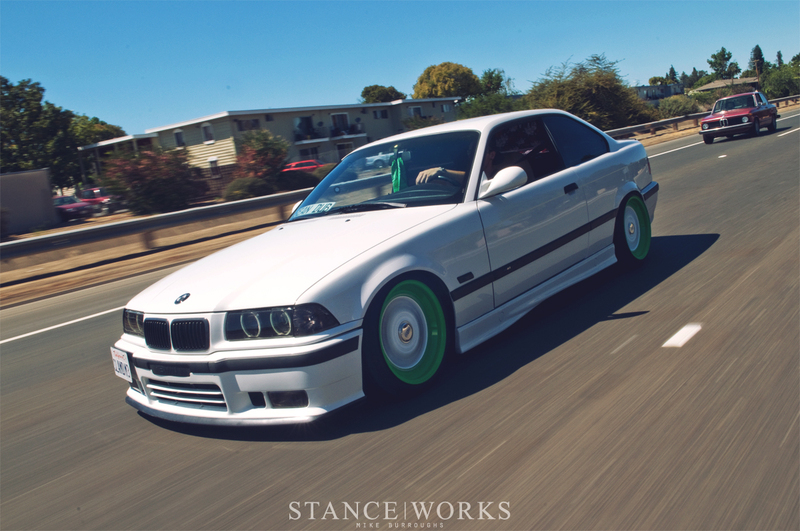 On the other side of the cul-de-sac was Brad's project E36, and just in time, Mike Theron arrived in his E36 sedan, complete with freshly painted wheels and newly mounted tires. 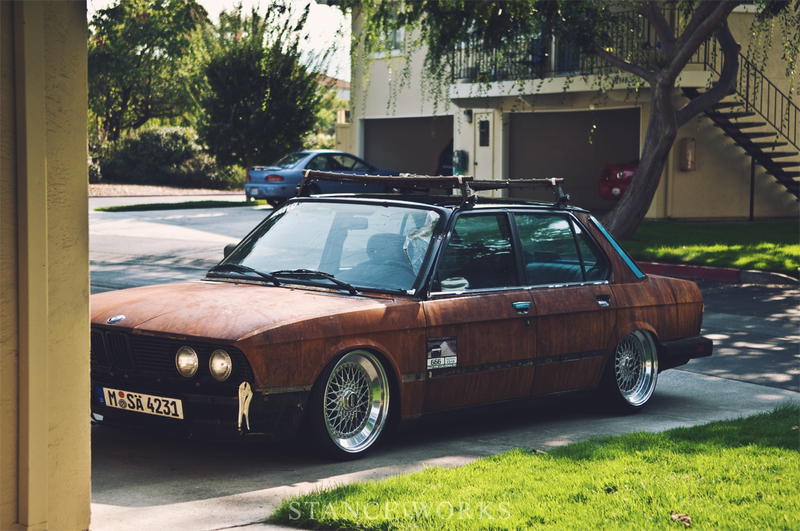 Tucked in the back was Brad's E28, which was getting the same treatment. Compared to the driveway happenings of Tennessee at the time, Andrew and I felt like we were in automotive heaven - we controlled the neighborhood, with cool cars tucked in to every spot available as others showed up to join us. 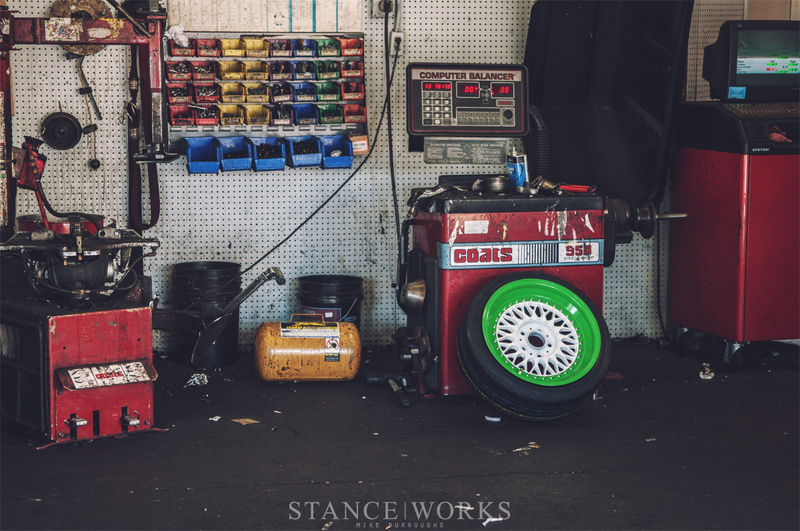 Inside the garage, Brad had begun cutting his stock E28 strut housings, wanting to install a Ground Control coilover setup and a new set of wheels and tires. 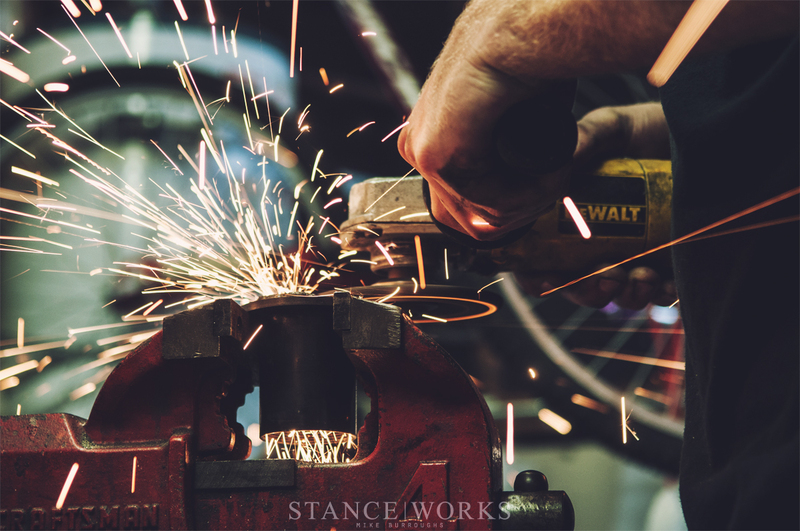 Sparks flew as he made the changes, and once the welds were laid, and after his father gave him a hard time for the less-than-pretty craftsmanship, we gave it a "good enough" stamp of a approval. That's all any of us required at the time. Outside the garage, we spent the afternoon enjoying the sun, and with a two-person bicycle found tucked away in the garage, we put it to good use, and by the end of the night, we thinking up challenges involving riding as a single person - on the back seat. It was good to be with friends. The next morning, back at Sean's house, we got ready for Sean's "big day." After moving my car, Sean gave his a thorough wash. A set of Fuzion ZRI tires sat in the living room of his apartment, begging for a new home, and, along with Bryan Zichterman's help, Sean's new wheels were finally ready for duty. 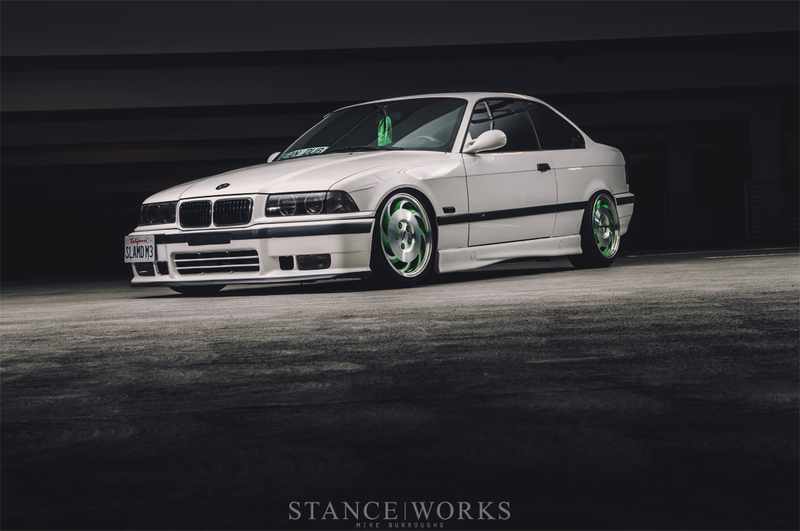 In the trunk of the M3 sat a set of BBS RS212s - 17x8.5 et13 square, complete with classic BBS slant lips. While it's today's "what was I thinking?," in 2009, we were excited to see the white-centered green-lipped RSs mounted to the BMW coupe. 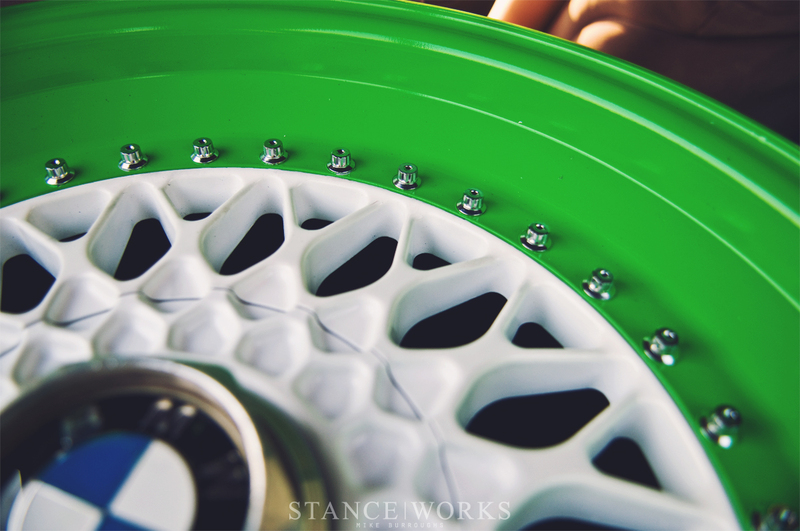 Sticking with Sean's signature color, the wheels were sure to offer a punch to the retinas of everyone on the StanceWorks boards. We returned with mounted wheels and tires, and bolted them to the car. We shared photos of the updated look on the forums, including big, black censors over the wheels, teasing our friends in a fashion that has stuck even to this day. We fired sample photos over to Performance BMW Magazine, whom had expressed interest in a feature of Sean's car, and waited to hear back which set of wheels they enjoyed more. Chapter Seven: Keepin' it "Wicked Pissah"
Sean, Andrew, and I hopped in the cars and went to Bryan Zichterman's work - with his old man as the boss, it meant we could bend the rules of a work day. 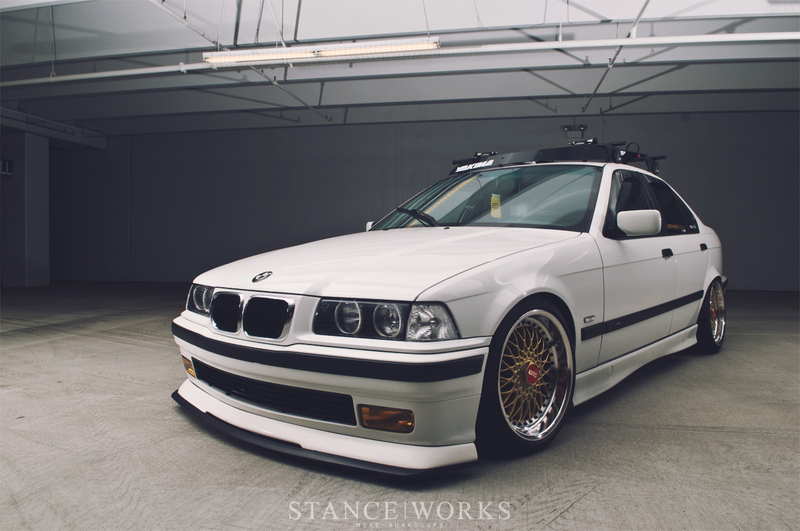 Meeting us there was Johnny Sisomphone - Bimmerforums superstar - and his track-ready E36. The day was filled with shenanigans - scooters, both powered and not, lead to hours of fun jumping parking stumps in the back lot. 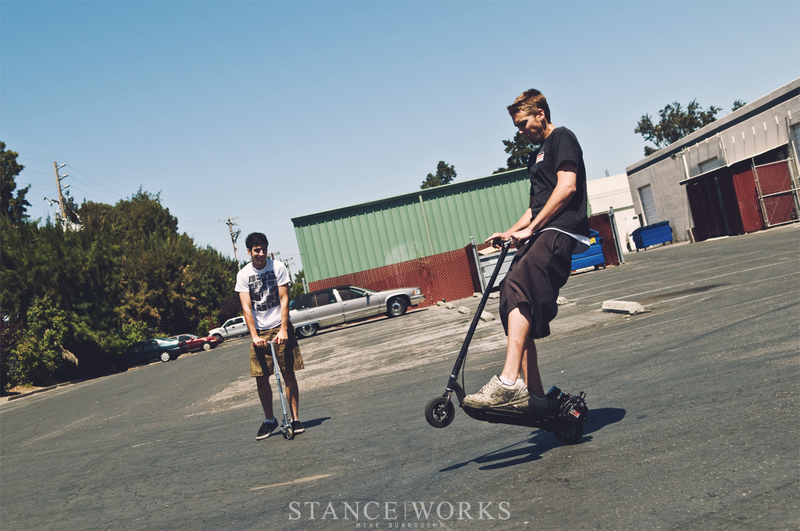 Andrew and Bryan continued to up the ante, calling each other out for bigger and better tricks. Sean borrowed Johnny's race buckets for the afternoon, hoping to ensure he'd enjoy the fit and finish in his own car. 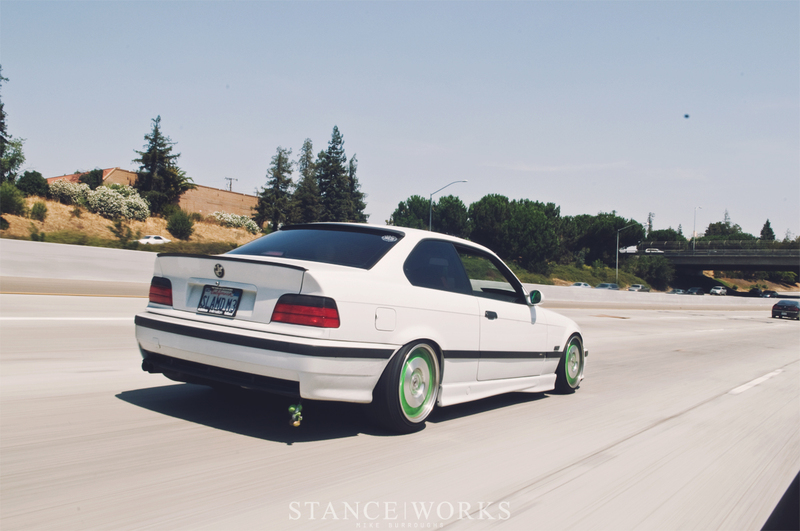 In turn, Johnny borrowed the 18" BBSs off of Rusty, eager to see how they'd fit on an E36 coupe. Inside the shop with the door closed, we shot some photos of Sean's car on the new wheels with the seats in place - and without hesitation, Sean was set on owning them. That night, with Mike Theron and others, we set up an evening of kart racing. With an "enduro" race taking place, Andrew, Mike, and I took to the wheel as a three-man team. 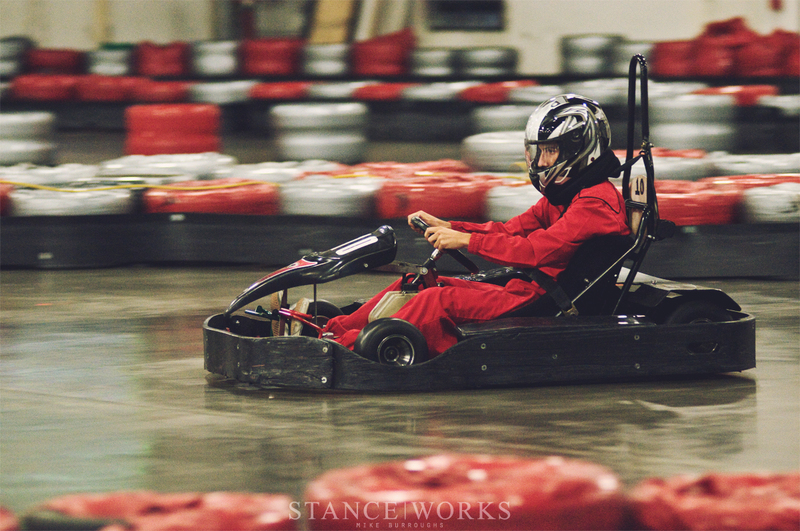 One way or another "Team StanceWorks" was misheard as "Team The Stance," but nonetheless, we took an early lead and held it. At least, that's how I like to remember it. In reality, we finished 4th of 10 - just off the podium. Andrew and I blame it on no experience with the track, and trouble getting the seat belts buckled during driver changes. Yeah, that's it... the seat belts. We rounded out the night by meeting up with more friends - Aris Agreda and Jerry Buenviaje, both owners of MX73 Cressidas - for photos of course. 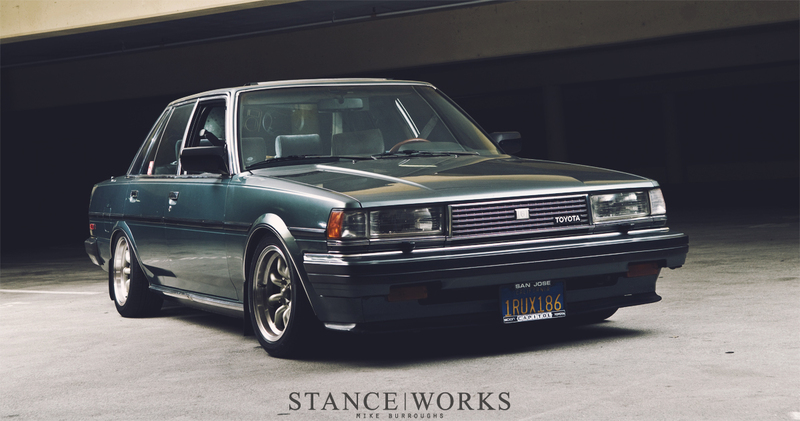 Aris's car was clean and simple, but knowing Aris's builds, we assumed it wouldn't be long before it received the full treatment. Opposite Aris's car was Jerry's - built to slide. A 1JZ under the hood and an assortment of other goodies had me quickly falling in love, with both the engine and car itself. As we stood under the parking garage, I chatted with Jerry about his power plant of choice, having no idea that our jokes of how cool it might be to put the same engine in Rusty would eventually lead to him flying out to TN to help make it become a reality. And lastly, under the garage, we shot Sean's car once more. After hearing back from PBMW that they preferred the sawblade wheels, we re-installed them and set did what we do best. Hoping for the cover page, we shot for hours, making sure to capture everything our friends across the pond might need. 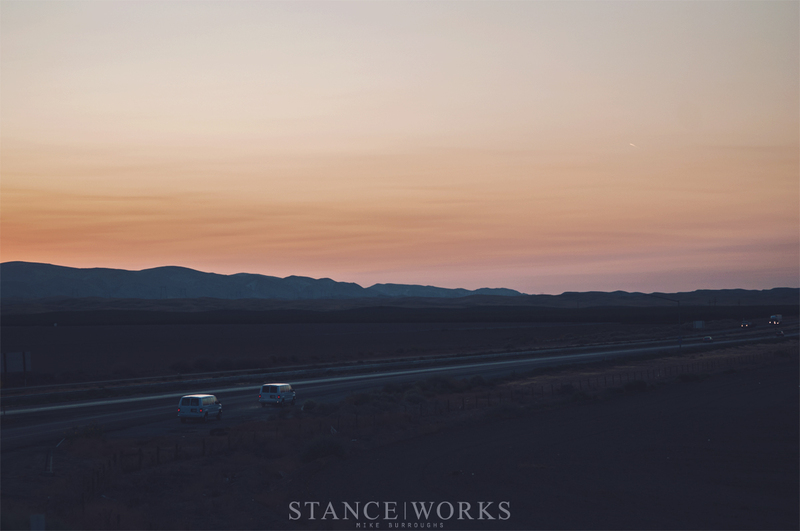 Through the photo shoots, hang outs, and shenanigans we had all gotten in to, it was clear after just a few days in California why the bond between us all, and StanceWorks, was so strong. Who'd have guessed a few years later I'd be living out here too? Next week, we'll post Part IV, the final segment of our road trip! I always really dug Sean’s car on the RS wheels. Interesting that PBMW preferred the blades. They probably look more interesting than the RS’s because rs’s are overused. Mike’s black 36 looks awesome. All the cars look awesome, but that one appeals the most to me. Fun read again. Sounds like such a good time. 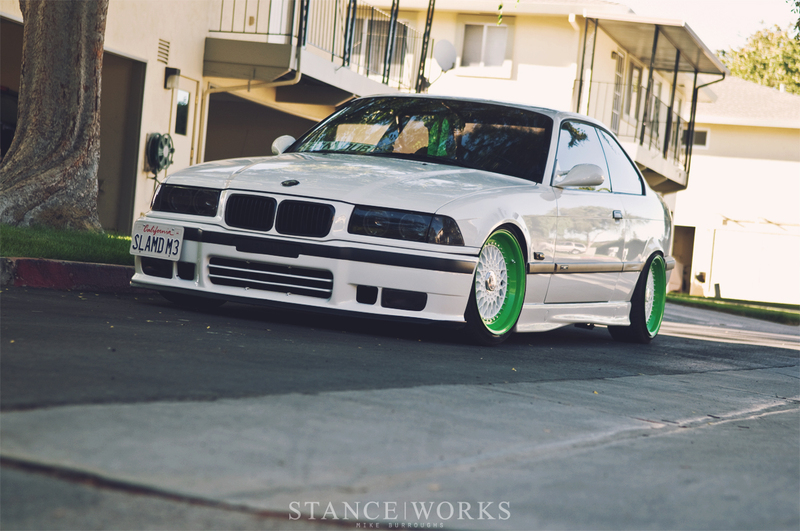 I’m sorry but you couldn’t make an e36 uglier.. Are those 82 corvette wheels. I just threw up in my mouth. Foul. With a matching bandana. Waaaaay too ironic for ironic’s sake. Bordering retarded. Everyone has their tastes. There are two ways to make a car…with pride (whether you built it or bought it) or just put on stuff just b/c its the “in thing” to do or you just jenk it up i.e. go to Pep Boys and Autozone and buy some stick on vents. As long as it was done well that is all that matters in the end….whether import, euro, truck, lowrider, bikes, classics, whatever…we all have a common bond and that is our rides. You enjoy and love your ride in the end. Then that is all that matters. My two cents…. Have a great day! i’ve never been so excited about a blog in my whole life. can’t get enough of this story! awesome cars, awesome writer. keep it up dude. I’ve been really enjoying these cross country leads you’ve been posting. It’s also really nice to know that you’ve stepped down into San Jose. 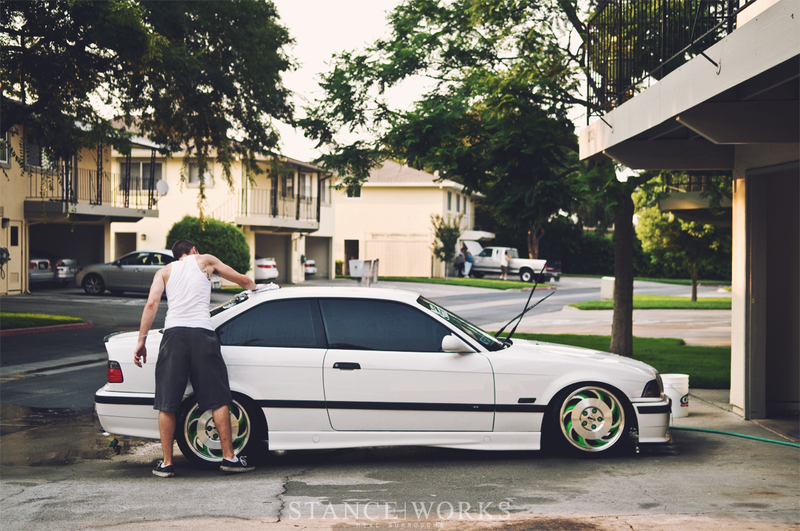 In the photo of sean cleaning his e36, that neighborhood looked so familiar, but I could be wrong. Definitely inspiring and enduring, can’t wait for the next. Best Regards! I’ve been really enjoying these cross country reads you’ve been posting. It’s also really nice to know that you’ve stepped down into San Jose. 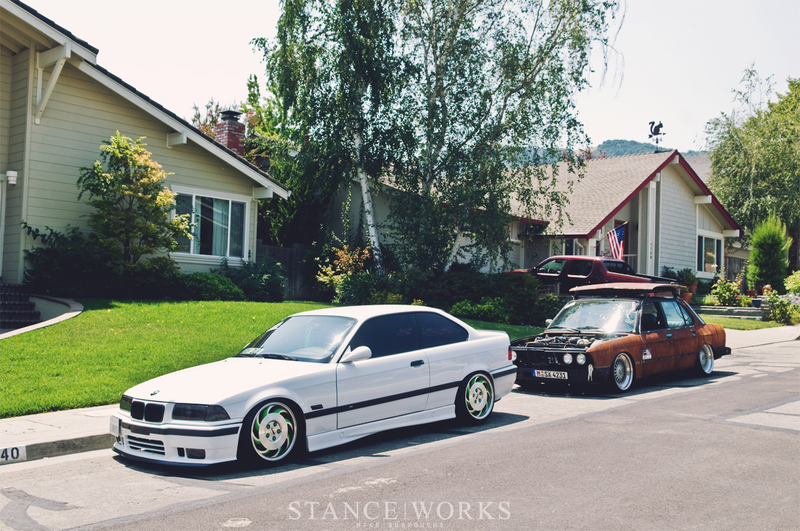 In the photo of Sean cleaning his e36, that neighborhood looked so familiar, but I could be wrong. Definitely inspiring and enduring, can’t wait for the next. Best Regards! Mike, this is the new rusty? Did I miss an article somewhere? I remember reading about plans for the poor burnt rusty slammington having a new life. But is that it? Is it an all new rusty or were you able to pull parts from the old one? I think it’s been over a week…where’s part 4!? part IV… where art thou?